The food and beverage industry is one of the few industry sectors that is recession proof. However, it is also one of the most diverse, cost conscious and innovative industry sectors in the world. Our research experience covers from field to fork and includes farms, ingredient suppliers, processing plants and the ever powerful retailers. Over the last 20 years of we’ve researched almost every aspect of the food industry. This deep understanding of the sector gives our clients peace of mind. We can save time and money coming up with solutions to help your business as we are fully grounded in the market. We are regularly researching arable farmers covering the fresh produce that they grow (grain, sugar beet, fruit & vegetables) and livestock farmers covering (fish, poultry, game, beef, pork). We also research the market for farming equipment, fertilisers and pesticides. We are experts on food packaging for fresh produce, protein, cheese and dairy, beverages, bakery, dry foods and convenience foods. We know films and wraps, cardboard, plastic and glass containers plus the packaging machinery and gas suppliers that supply into the wider industry. Over the years we have walked the floors of many food processing plants, breweries and abattoirs, interviewing those who spend a significant amount of time on the shop floor. We have engaged with the all-important, time-pressed key decision makers down the value chain responsible for spending millions on equipment each year. We know retailers and what drives their choice of chilled, frozen and prepared foods. We have helped our clients develop ideas and strategies for selling new products into different channels and geographies. Nothing we offer is off-the-shelf. Every project is developed from scratch according to your unique requirements. We’ll give an honest and impartial evaluation of your research brief, your position in the market and the opportunities for your brand. Our team of experts will help make the most out of the findings by working with you to implement the recommended tactical and strategic changes. The two golden rules of research are that you must ask the right questions of the right people. We have 20 years of experience of speaking to target audiences in the food & beverage sector. Often the most sought after group of respondents that our clients would like us to speak to in the food and drink industry. These are the people who make key decisions. We know how to get hold of them and more importantly, how to get them to open up in an interview. They include research and development, technical, purchasing, operational, health and safety and senior management. They may be based in head offices, in production plants, behind a bar or out in the field on a farm. No matter who they are and where they are in the world we have the ability to connect with them and gather their opinions. Distributors, wholesalers and merchants have become vitally important in the distribution of food and beverages. 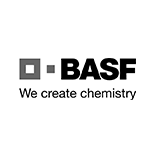 We regularly research this group who play a key role in getting food products from manufacturers to consumers. There are many instances when it is crucial for us to research people who operate the plants or work on the farms. This target group heavily influence the purchase of what they use. We know how to get to these people who are in the fields, in the factory, on the road or the shop floor. CEOs, VPs and owners of companies sometimes order products and they certainly heavily influence the buying decision. These are busy people but with the right approach we can always interview them. We’ve carried out research projects spanning the entire food and beverage industry, from basic ingredients such as sugar and wheat to the global seafood and ready-meal industry. Whether it is understanding future trends and requirements of retailers or what is going on in the global beverage market for soft drinks and alcoholic drinks, we have the knowledge. 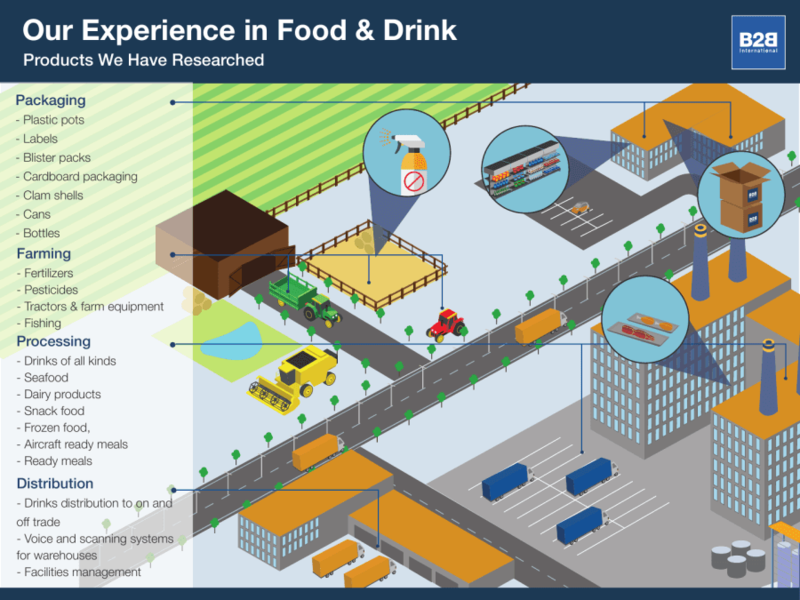 To see the full list of areas we’ve researched in the food and drink sector, click the link below to view the graphic.